Please note that no employee of The Bank of Tampa or company affiliated with The Bank of Tampa will contact you and ask that you verify personally identifiable information (social security number, date of birth, credit card or debit card information, etc.). If you ever receive this type of phone call, please ask for the name of the caller, hang up and call The Bank of Tampa directly, as this could be an attempt to secure your personal information for fradulent purposes. Please note that no employee of The Bank of Tampa or company affiliated with The Bank of Tampa will contact you via email or phone requesting your Online Access ID or Password. If you are contacted by anyone requesting this information, please contact us immediately at (813) 872-1200. Use dual control methodology for initiating and approving all online payments. Incorporate multi-factor authentication (e.g., tokens) into the login process for every user. Restrict the use of ACH and wire templates to "repetitive" or "semi-repetitive" whenever possible. To protect your Visa Debit Card and Visa Credit Card accounts, we monitor your transactions for potentially fraudulent activity, which may include a sudden change in locale (such as when a U.S.-issued card is used unexpectedly overseas), a sudden string of costly purchases made, or any pattern associated with fraud trends around the world. If we suspect fraudulent activity is occurring on your Visa Debit Card, we will contact you to validate the legitimacy of your transactions. Your responsiveness in responding to our call is critical to prevent potential fraud and to avoid restrictions we may place on your card. Our automated-dialer system will ask you to verify recent transaction activity on your Visa Debit Card. You will be able to respond using your touchtone keypad. A toll-free number will be provided should you have additional questions. The call will be identified as coming from The Bank of Tampa's card service center. The automated system will confirm whether the call recipient is the cardholder by speaking the cardholder's name. If the cardholder is unavailable, a message is played asking that the cardholder return the call and the appropriate toll-free number is provided. If the cardholder is available, the system verifies the cardholder's identity by prompting them to enter the last four digits of their Social Security number. Once your identity is confirmed as the cardholder, you will be prompted to confirm the reported transaction(s) as legitimate or suspect using your telephone keypad. If you indicate that you do not recognize the reported transaction(s), the call is automatically routed to a fraud alert management representative so that further action may be taken. If all transactions are acknowledged as legitimate, the call is completed and no action is taken. Your PIN is private. Never give it out. Cashiers taking your card out of sight. Take your card to the register yourself. Any unusual activity occurring at an ATM. If you feel uncomfortable, go to another ATM. Ask you to verify your card or account number. Such e-mails are not sent by legitimate entities. Links to websites. Such sites can look legitimate, but may collect data or put spyware on your computer. Our goal is to minimize your exposure to risk and the impact of fraud. To ensure we can reach you when potential fraud is detected, be certain to keep us informed of your current phone number and address at all times. Additionally, if you are planning any travel abroad, please inform us at (813) 872-1200 or contact your banking office so that purchases and withdrawals made overseas will not be flagged as suspicious. Informing us of travel overseas will ensure uninterrupted use of your Visa Debit Card and/or Visa Credit Card. Finally, it is important to be diligent in monitoring your card account activity. Please contact us immediately at (813) 872-1200 if you identify any fraudulent transactions. Many of our clients have experienced problems with their Visa Debit Cards and/or Visa Credit Cards being rejected during times of foreign travel. If you plan to travel abroad and intend to use your Visa Debit Card or Visa Credit Card during that time, please let us know. Your debit and credit cards are automatically protected by a fraud detection service that reviews transactions as they are processed. To save potential time and hassle during your trip, please contact us prior to your departure to verify your travel dates, destination(s), and the contact information to be used while you are away. The Bank of Tampa will notify its fraud detection service of your travel plans and your intended destination(s). If this measure is not completed beforehand, it is possible you may find your card blocked when you attempt to use it. It is important to note that, even if the proper precautionary measures are taken prior to departure, the use of your Visa Debit Card or Visa Credit Card may still prompt a phone call from our fraud detection service during your travel time. Foreign transactions are watched particularly closely due to the high volume of fraudulent activity that takes place overseas. Our fraud detection service is an automated service. Should unusual patterns in purchase behavior start to appear, you will automatically be notified. Any calls generated will occur only if activity on the account scores in such a way to generate suspicion. In those cases where a phone call is received from our fraud detection service, a return call to The Bank of Tampa will be essential in order to prevent your card from being blocked for use. It is possible we may not be able to reach you when we have concerns about transactions giving the appearance of fraud. In such cases, we may need to take preventative action and block your card until you can be reached in order to prevent potentially fraudulent activity from taking place. A return call to The Bank of Tampa will be required to confirm your transactions and remove the block from your card. In case of an emergency, we recommend that you carry more than one form of payment, such as other credit/debit cards and/or travelers checks and local currency (both available at The Bank of Tampa). If you notice any unsafe conditions at one of The Bank of Tampa’s ATMs (such as non-working lighting), please contact us at (813) 872-1200. Please be aware that e-mail is generally not secure. E-mail sent to us by outside sources via our public domain is not encrypted and may not be secure. Confidential information should not be included in e-mails sent to us. Pay inside the store to ensure credit card information stays safe. Use a credit card instead of a debit card. Credit cards have better fraud protection and the money is not deducted immediately from an account. If using a debit card at the pump, choose to run it as a credit card instead of entering a PIN. That way, your PIN remains safe. Regularly monitor your bank accounts to spot any unauthorized charges. Consumers who suspect their credit card number has been compromised should report it immediately to the authorities and their credit card company. Each year, thousands of people are victimized by financial crimes such as identity theft and other forms of fraud. The Bank of Tampa is constantly working behind the scenes to ensure that client information and financial transactions are protected to the highest standard possible. At the same time, we ask our clients to frequently and carefully review their account activity and immediately let us know of any discrepancies or suspicious activity at (813) 872-1200. The United States Federal Trade Commission (FTC) maintains a website to provide a one-stop information resource for consumers and businesses pertaining to fraud prevention and response. The website is Federal Trade Commission. 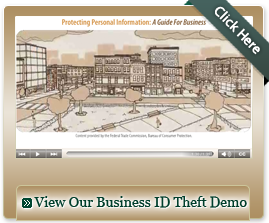 In addition, the FTC has another website to help with the identification of and recovery from identity theft. 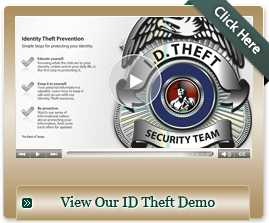 If you have fallen victim, or if you would like more information on the topic, please visit IdentityTheft.gov. This site can help you determine critical steps, and gives detailed advice and helpful resources—like easy-to-print checklists and sample letters. The site also connects you to organizations that are critical to the recovery process, such as credit bureaus, the Social Security Administration, the IRS, and local consumer protection offices. Please review the information on these websites and bookmark these valuable resources for future reference. The FTC, in partnership with other federal agencies, also manages OnGuardOnline.gov, which is a website that helps enable customers to be safe, secure, and responsible online. Visit their website for information on new and emerging threats. The FDIC also has a website dedicated to consumer news. Click here for direct access to the FDIC Consumer News Website. While the Bank may contact you regarding your account and/or suspected suspicious activity, the Bank will never ask you to provide your login credentials over the phone or via e-mail. Below are some helpful tips to help protect businesses and individuals from identity theft and fraud. Perform appropriate risk assessment and internal control evaluations periodically. The Bank of Tampa is committed to providing a secure web presence. Keeping your financial and personal information secure and confidential is one of our most important responsibilities. The bank uses industry-proven encryption and network security standards to ensure your data is protected. Our Personal and Commercial Online Banking websites use the industry standard for encrypting and protecting your data and may disallow traffic that does not support that standard. Please use our “Contact Us” page if you are having issues connecting. Please be aware that email communication is transmitted over the public internet and may not always be secure. Please use the bank’s secure email portal whenever you email confidential information to the bank. The secure email portal will encrypt the information to help ensure it is protected. Instructions and information on sending emails through the banks secure email portal can be found on our “Contact Us” page. Please keep in mind that full account numbers should not be included in email communications and that bank employees will never ask for your password to any system. We may provide links to non-Bank companies such as Harland Clarke, our preferred check printing company. If you choose to link to sites not controlled by The Bank of Tampa, we are not responsible for the privacy or security of these sites. We encourage you to review the privacy policies of such sites. If you provide information about your accounts with The Bank of Tampa to an aggregator company, all transactions initiated by the aggregation site via the access information given will be considered authorized, whether or not you were aware of a specific transaction. If you decide to revoke the authority you have given an aggregator company, we recommend that you change your Bank password to ensure that the aggregator company cannot continue to access your account.